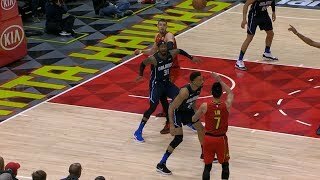 Jeremy Lin Highlights - Magic at Hawks 2/10/19 Jeremy Lin scores 12 points in 21 minutes of play in addition to 4 assists 3 rebounds and a single turnover. Most importantly, Jeremy shot above 50% from 3, a noticeable improvement from his past few games. Jeremy Lin Highlights - Hornets at Hawks 2/9/19 Jeremy Lin scored 13 points in addition to 4 assists, 2 rebounds, and 1 turnover in a tough loss to the Charlotte Hornets. Overall Jeremy played quite well and shot above average from the field, but the Hawks could not get the stops they needed for the win. 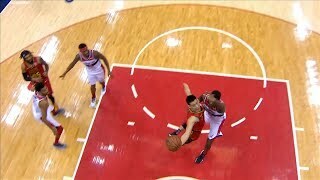 Jeremy Lin Highlights - Hawks at Wizards 2/4/19 Jeremy Lin scores 11 points in 21 minutes, a noticeable uptick from the prior few games. He also had 4 assists, 4 rebounds, and 2 turnovers and heavily contributed to the win tonight. Jeremy Lin Highlights - Hawks at Kings 1/30/19 Jeremy Lin scores 11 points to go with 5 assists and 2 rebounds with only 1 turnover. However the game itself was out of hand by the 2nd quarter as the Kings dominated the Hawks in the post and on the outside. 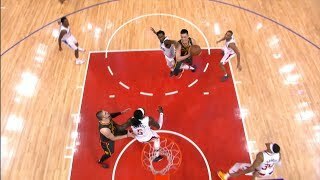 Jeremy Lin Highlights - Hawks at Clippers 1/28/19 Jeremy Lin scores 13 points to go with 4 assists in a night where the Hawks dominated much of the game against the Clippers. Jeremy Lin Highlights - Hawks at Bulls 1/23/19 Jeremy Lin scores 15 points to go with 4 assists, 2 rebounds, and 3 turnovers. Jeremy contributed most his points during the earlier parts of the game, and helped give the Hawks a blowout win against the Bulls. Jeremy Lin Highlights - Heat at Hawks 1/6/19 Jeremy Lin scores 15 points in just 16 minutes to go along with 5 assists, 1 rebound, and 1 turnover. 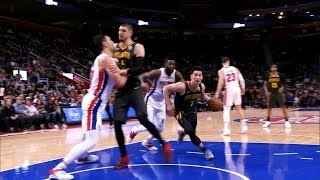 Jeremy Lin Clutch in 4th Quarter - Hawks at Pistons 12/23/18 Jeremy Lin subbed in late in the 4th quarter as the Pistons were making a run at the Hawks, who had led for most of the game. Lin was instrumental in securing the win tonight with a clutch reverse lay-up and four big free throws. Jeremy's final stat line was 10 points, 4 assists, 3 rebounds, and 1 turnover. 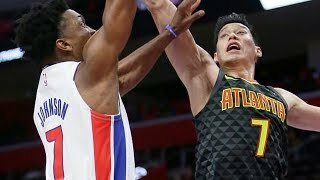 Jeremy Lin Full Highlights - Hawks at Pistons 10 PTS / 4 AST / 3 REB in 17 minutes played. Jeremy Lin once again comes through clutch in the 4th quarter to help the Atlanta Hawks win their 3rd straight game against the Detroit Pistons. Jeremy Lin Dominates in the 4th Quarter Win - Wizards at Hawks 12/18/18 Jeremy Lin had a tremendous game scoring 12 of his 16 points in the 4th quarter and carried the Hawks to their 7th win of the season. Jeremy also had 4 assists, 3 rebounds, and drew multiple crucial fouls. 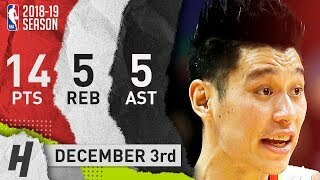 Jeremy Lin Great Offensive Performance Against Raptors - 11/21/18 Jeremy Lin had an extremely efficient night on 11/13 shooting, hitting 4/5 threes and scoring 26 points while playing just 25 minutes. Jeremy Lin Highlights - 11/17/18 Hawks at Pacers Jeremy Lin has another very efficient shooting night scoring 16 points on 7/11 shooting to go along with 4 assists, 4 rebounds, 3 steals and 4 turnovers. Jeremy also played some tough defense in this game and the Hawks looked like they were in control for much of the game prior to the 4th quarter. 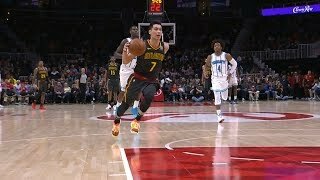 Jeremy Lin Highlights - 11/15/18 Hawks at Nuggets Jeremy Lin had a solid performance against the Nuggets with 16 points, 5 assists, and 5 rebounds. Unfortunately the Hawks shot very poorly this game while allowing Denver to shoot 56% from the field and lost in a blow out. Jeremy Lin gets 4th qtr minutes over Trae Young - 11/14/18 Hawks at Warriors Lloyd Peirce gave Jeremy the majority of 4th quarter minutes including allowing him to finish the game. Trae Young struggled shooting the ball tonight, but typically has always gotten late game minutes. Curious to see if this is a trend that may continue. Jeremy Lin extremely efficient against Hornets - 11/6/18 Jeremy Lin scores 19 points in just 18 minutes off the bench to go along with 2 assists and 2 steals for the night. Jeremy's confidence and rhythm are coming back to him. Seems like he has the extra pep in his step, when attacking the basket. 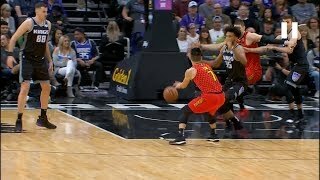 Jeremy Lin Highlights - 11/1/18 Kings at Hawks Jeremy Lin scores 23 points to go along with 1 assist, 1 rebound, and 1 steal in 23 minutes of play. You can tell his aggressiveness is increasing, which is translating to better volume stats. Jeremy Lin's Best Game as a Hawk thus far -10/30/18 Hawks at Cavs Jeremy Lin scores 12 points to go along with 8 assists in 24 minutes tonight against Cleveland. The Hawks were on a 2nd night of a back-to-back and perhaps feeling lethargic in the 2nd half, where the game fell out of control. Lin played his best game to date, dishing out multiple passes for easy scores inside and out. His aggressiveness is a positive sign. Jeremy Lin: Limited Minutes in Philadelphia - 10/29/18 Hawks at 76ers Jeremy Lin scored 6 points on 50% shooting, also grabbed 2 boards. The good news is that he scored the most points in the past 4 games, but unfortunately did not play heavy minutes, particularly in the 2nd and 3rd quarters when the Hawks fell behind. As Wilkins mentions, Lin still looks like he's not 100% aggressive. He tends to pass and cut onto the weak-side more often than looking to take a pick. Jeremy Lin Highlights - 10/19/18 Hawks at Grizzles Jeremy Lin scored 9 points to go with 2 assists and 2 rebounds in 17 minutes of action. He had a quiet night until later in the 2nd half when the game had already gotten away from Atlanta. However there was a moment where Lin and Young split ball handling duties and looked to be in sync with each other. If Lin can maintain his aggressiveness, he can make a case for being the 2nd ball-handler next to Young during more pivotal moments. Jeremy Lin ATL Debut Highlights - 10/17/18 Hawks at Knicks Jeremy Lin scores 8 points to go along with 5 rebounds, 1 steal, 1 assist, and 2 turnovers in 14 minutes in his first regular season game as an Atlanta Hawk. This game was a struggle for both Lin and the Hawks. The Knicks went on a run in the 2nd quarter and never looked back. Jeremy looked great in the 1st quarter, but seemed tentative afterwards, with the exception of some late minutes in the 4th. Last year, Jeremy went down for the season in his very first game of the season, so perhaps there were some fears tonight that fed into a more cautious approach. However, at the end of the 4th, he went coast to coast twice and looked like his usual fearless self. Jeremy Lin Preseason 10/1/18 Plays and Highlights - Pelicans at Hawks It's been too long since I last posted a video for Jeremy, it's good to see him on the court again. I wasn't able to catch the beginning of the game and might have missed out on some assists, but tried to capture most of the plays Lin was involved in. I noticed the Hawks run some similar motion type plays compared to the Nets of last year. This makes sense considering Atkinson previously was an assistant coach for the Hawks under head coach Mike Budenholzer. Although of course Budenholzer was replaced this year by Lloyd Pierce, the returning core players are likely still most familiar with this system. Unfortunately I won't be able to post highlights for most if not all of the Hawks' preseason schedule, but will be good to go for the regular season on October 17th!